As a general policy, with the exception of IP addresses, no Personal Information is automatically collected from visitors to the Printing Peach website. Printing Peach may gather and analyze IP addresses and certain Information of a Non-Personal Nature regarding website usage by visitors to the Printing Peach website. Such data is used in an aggregate form to assist Printing Peach in determining general usage patterns and to administer, diagnose problems with, and fine tune the layout of the Printing Peach website. We may share non-personal, summary, or aggregate customer data with partners and other third parties at our discretion. to contact you regarding other products or services which may be of interest to you (including those that we may offer jointly with other companies). We will not give, sell, rent, or loan any of your Personal Information to any third party (with the exception of third parties performing functions on our behalf who have an obligation to keep your information completely confidential) unless you have authorized us to do so. 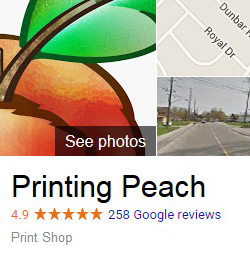 Printing Peach reserves the right to access and/or disclose Personal Information where required to comply with applicable laws or lawful government requests or, in Printing Peach’s reasonable opinion, to operate the Printing Peach website properly and securely, or to protect Printing Peach or visitors to this website. To the extent reasonably possible, Printing Peach shall attempt to obtain the prior consent of the individual to whom such Personal Information relates prior to disclosure to third parties.